Once again the gaze of the BrokeAndBroker.com Blog falls upon a Financial Industry Regulatory Authority settlement involving a stockbroker who got a verbal go-ahead from some customers to exercise trading discretion. Unfortunately, as we have written with some regularity, oral authorization is often worth the paper it's not written on. 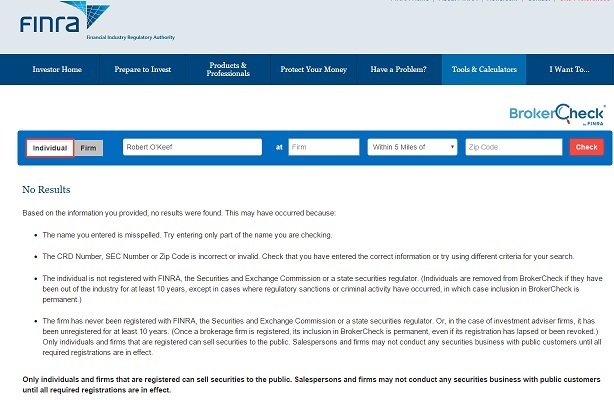 Oh, and another thing, FINRA seems to have lost today's featured Respondent in their high-priced, highly-touted BrokerCheck database. Oh my! But, don't fret, oh no, BrokeAndBroker.com's publisher Bill Singer has solved the puzzle. Oh, say can you see? Okay, Bill did. OMG, it was quite a hunt to figure out what was wrong In the end, it came down to an "O" and an apostrophe. You may enjoy reading about Bill's hunt and chase, which lasted into the wee hours of the evening. Oh, what a night! For the purpose of proposing a settlement of rule violations alleged by the Financial Industry Regulatory Authority ("FINRA"), without admitting or denying the findings, prior to a regulatory hearing, and without an adjudication of any issue, Robert F. O'Keef submitted a Letter of Acceptance, Waiver and Consent ("AWC"), which FINRA accepted. In the Matter of Robert F. O'Keef, Respondent (AWC 2014040938602, February 23, 2016). O'Keef had entered the securities industry in 1974 and became registered in 1989. By 2006, he was registered with FINRA member firm RBC Capital Markets, LLC, where he remained until April 2014. The AWC asserts that O'Keef had no prior relevant disciplinary history. The AWC asserts that during the relevant time from October 1, 2012 to January 23, 2014, O'Keef effected about 654 discretionary transactions on behalf of four RBC customers. The AWC concedes that those customers "had orally authorized O'Keef to exercise discretion in their securities accounts." During the relevant time, RBC prohibited the use of discretion for the customer accounts at issue. Moreover, applicable NASD Conduct Rule 2510(b) required that a registered representative obtain prior written authorization from a customer in order to exercise discretion and that the employing member firm approve such trading, which did not occur. RBC terminated O'Keef as a result of the discretionary trading. FINRA deemed O'Keef's conduct to constitute violations of NASD Conduct Rule 2510(b) and FINRA Rule 2010. In accordance with the terms of the AWC, FINRA imposed upon O'Keef a &dollar;5,000 fine and a 15-business-day suspension. Not willing to give up, I went back to the AWC and entered O'Keef's Central Registration Depository Number, which was 351684 and, lo and behold, this Respondent's name had somehow been transformed by FINRA (or was entered into the AWC wrong in the first place) from O'Keef to Okeef! 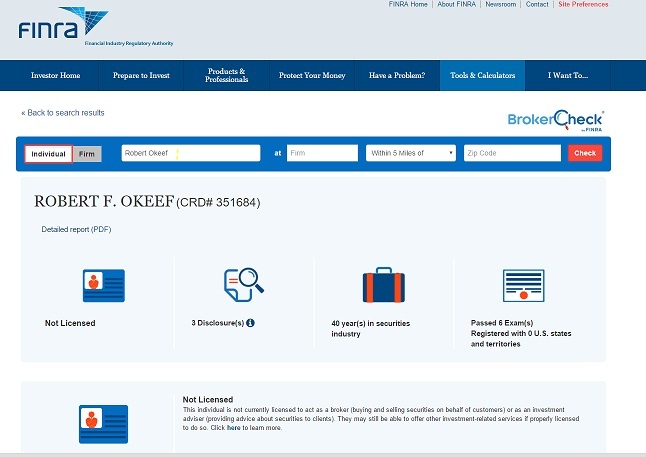 The odd thing about the BrokerCheck records for "Okeef" is that the references to him by name in the online document are to "O'Keef". Why FINRA doesn't have a search device that would yield "Okeef" for "O'Keef" and "O'Keef" for "Okeef" is an interesting question but I will leave that for more technically adept folks to grapple with. Now that the self-regulatory organization is aware of both the specific data entry error and the inability of its search device to discern between "Okeef" and "O'Keef" perhaps the glitches will be fixed. Maybe I will get a Certificate of Appreciation or a Letter of Commendation? Absent that, perhaps the good folks at FINRA will take down that dartboard with my face on it or, at best, stop throwing darts at my image for one full business day. CUSTOMER FEELS THAT TRADING ACTIVITY IN A JOINT ACCOUNT WAS TOO HIGH IN 2013. HE ALSO NOTED HE DID NOT SPECIFICALLY GIVE AUTHORIZATION FOR MANY OF THE TRADES. ON MARCH 24, 2014 O'KEEF ACCEPTED AN OPTION ORDER FROM THE CLIENT'S SPOUSE WITHOUT THE CLIENT'S WRITTEN AUTHORITY TO DO SO. CLIENT DID NOT OBJECT TO THE TRANSACTION WHEN CONTACTED AFTER THE FACT. COVERED CALL FOR CLEAN ENERGY FUELS CORP.
Reprinted below is FINRA's Conduct Rule 2510: Discretionary Accounts, which imposes a simple compliance regime of prior written authorization by the customer coupled with the firm's written acceptance. Upon placing a duly authorized and approved discretionary trade, a member firm must undertake prompt written approval of each discretionary order; and, further, must frequently review all discretionary accounts to ensure that the transactions are suitable. That's about as straightforward a regulatory proposition as you could imagine. Note that Rule 2510(d)(1) carves out an exception for Time And Price discretion - T&P comes into play when there's a customer order "for the purchase or sale of a definite amount of a specified security" but for the exercise of time and price discretion by the stockbroker. T&P is an effective order ONLY "until the end of the business day on which the customer granted such discretion . . ." In the old days, there wasn't such an intra-day limit on T&P, which is why the one-business-day limit trips up a number of industry veterans. No member shall effect with or for any customer's account in respect to which such member or his agent or employee is vested with any discretionary power any transactions of purchase or sale which are excessive in size or frequency in view of the financial resources and character of such account. No member or registered representative shall exercise any discretionary power in a customer's account unless such customer has given prior written authorization to a stated individual or individuals and the account has been accepted by the member, as evidenced in writing by the member or the partner, officer or manager, duly designated by the member, in accordance with Rule 3010. The member or the person duly designated shall approve promptly in writing each discretionary order entered and shall review all discretionary accounts at frequent intervals in order to detect and prevent transactions which are excessive in size or frequency in view of the financial resources and character of the account. (D) The negative response feature will not be activated until at least 30 days after the date on which the letter was mailed.